a) Encourage students to read as often and as much as possible. The more students read, the better. 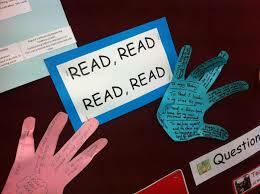 Everything we do should encourage them to read extensively as well as if not more than intensively. It is a good idea to discuss this principle with students. b) Students need to be engaged with what they are reading. Outside normal lesson time, when students are reading extensively, they should be involved in joyful reading. We should try to help them get as much pleasure form it as possible. But during lesson, too, we will do our best to ensure that they are engaged with the topic of a reading text and the activities they are asked to do while dealing with it. c) Encourage students to respond to the content of a text. It is important for students to study reading texts in class in order to find out such things as the way they use language, the number of paragraphs they contain and how many times they use relative clause. But the meaning, the message of the text, is just as important as this. As a result, we must give students a chance to respond to that message in some way. d) Prediction is major factor in reading. When we read texts in our own language, we frequently have a good idea of the content before we actually star reading. Book covers give us a clue what is in the book; photographs and headlines hint at articles are about; we can identify reports as reports from their appearance before we read a single world. e) Match the task to the topic when using intensive reading text. Once a decision has been taken about what reading text the students are going to read (based on the topic of the text), we need to choose good reading tasks the right kind of questions, appropriate, activities before during and after reading, and useful study exploitation. The most useful and interisting text can be undermined by boring and inappropriate tasks. f) Good teachers exploit reading text to the full. Any reading text is full of sentences, words ideas, description, etc. Good teachers integrate the reading text into interisting lesson sequences, using the topic for discussion and further tasks, using the language for the study and then activation , and using a range of activities to bring the text to life. Belum ada tanggapan untuk "Reading Principles"